Beirut (AFP) - US-led air strikes on Syria killed a total of 225 civilians over the past month, a monitor said on Tuesday, the highest 30-day toll since the campaign began in 2014. The Syrian Observatory for Human Rights said the civilian dead between April 23 and May 23 included 44 children and 36 women. The US-led air campaign against the Islamic State jihadist group in Syria began on September 23, 2014. 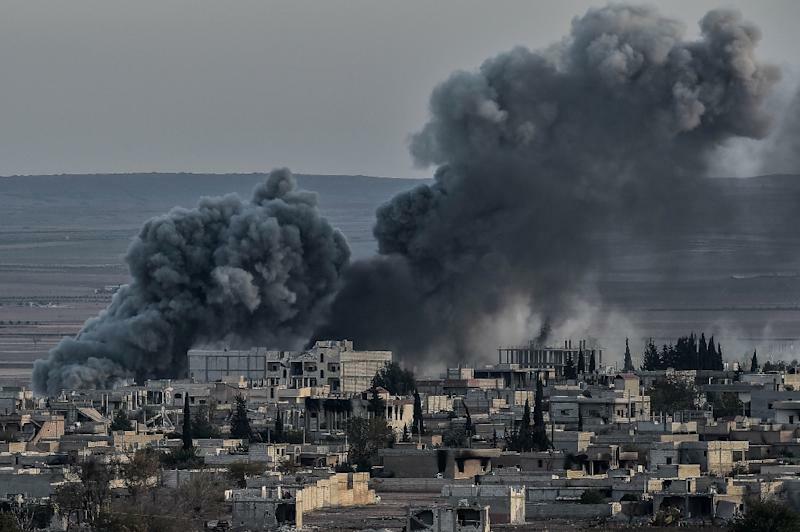 "The past month of operations is the highest civilian toll since the coalition began bombing Syria," Observatory head Rami Abdel Rahman told AFP. "There has been a very big escalation." The previous deadliest 30-day period was between February 23 and March 23 this year, when 220 civilians were killed, Abdel Rahman said. The past month's deaths brought the overall civilian toll from the coalition campaign to 1,481, among them 319 children, the Britain-based monitoring group said. Coalition bombing raids between April 23 and May 23 also killed 122 IS jihadists and eight fighters loyal to the Syrian government, the Observatory said. The loyalists were killed in a strike on a convoy headed toward a remote garrison near the border with Jordan being used by coalition forces. Earlier this month, the US military said that coalition air strikes in Iraq and Syria had "unintentionally" killed 352 civilians since the campaign began. The coalition launched operations against IS in Iraq in August 2014, then expanded them to Syria the following month. It is now backing twin offensives against IS's last major urban strongholds -- Raqa in Syria and Mosul in Iraq. It has deployed special operations forces on the ground in both countries as advisers. On Friday, US Defence Secretary Jim Mattis said President Donald Trump has instructed the Pentagon to "annihilate" IS in Syria in a bid to prevent foreign fighters from returning home. The president has "directed a tactical shift from shoving ISIS out of safe locations in an attrition fight to surrounding the enemy in their strongholds so we can annihilate ISIS," Mattis said, using an alternate acronym for IS.